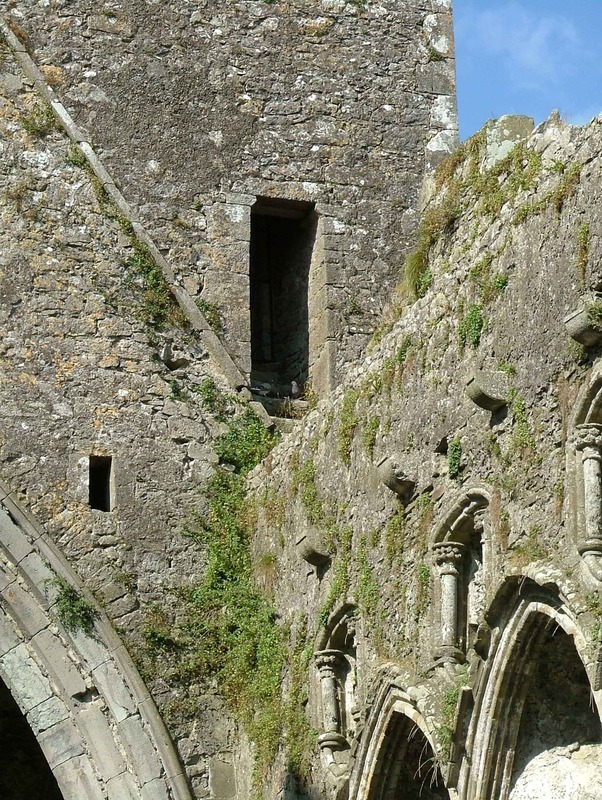 “St Patrick's Cathedral, Cashel, Co Tipperary, interior - choir, north elevation windows and east wall of tower,” Gothic Past, accessed April 19, 2019, http://gothicpast.com/items/show/1510. Photograph by Roger Stalley. View of the choir from the east showing rere - arches of quatrefoil windows filling the spandrels between five hood moulded lancet windows. The lancet windows have rere - arches richly treated with roll - and - fillets, hollows and rolls along with roll - and - filleted hoods. The rere - arches of the quatrefoil windows are unusual, having shafts with moulded bases and foliate capitals, shallow moulded arches above and moulded, curved sills below. A portion of north elevation of the crossing tower is visible showing chamfered arch mouldings, roof - line scar on the north elevation of the crossing tower and portal to tower access passage in the north - east corner of the tower.